After teasing the device for months, the Lenovo has finally launched its Z5s in China on Tuesday. 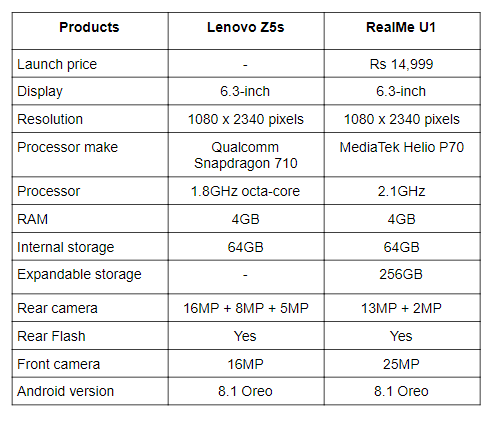 We are comparing the device with the RealMe U1 to see whether it will be able to give RealMe a tough competition. The Lenovo Z5s has launched in China on Tuesday, December 17. The smartphone is equipped with a Qualcomm Snapdragon 710 processor and sports a dew-drop notch on top. The phone is priced at CNY 1,398 (Rs 14,000 appx). On the other hand, we have the RealMe U1, which is the world’s first smartphone with a MediaTek Helio P70 processor. The RealMe U1 also has a water-drop notch on top, which gives you more viewing area. Let's just compare these two smartphones to see which one is offering the best when it comes to hardware. Let’s start by comparing the display of these two devices in detail. Both the device features a 6.3-inch display that offers a resolution of 1080 x 2340 pixels. They have a water-drop notch on top of the screen, which houses the front facing camera only. When it comes to the processor, the Lenovo Z5s is powered by a Qualcomm Snapdragon 710 processor, which is coupled with 4GB RAM and 64GB internal memory. On the other hand, the RealMe U1 is the world’s first smartphone, which comes with a MediaTek Helio P70 octa-core processor. The device packs 4GB RAM and 64GB internal memory, which is expandable to up to 256GB via a microSD card. As far as the cameras are concerned, one of the main highlights of the Lenovo Z5s is its triple camera set up at the back. The device comes with 16MP + 8MP + 5MP rear cameras along with a 16MP front-facing camera. On the other hand, the RealMe U1 has a dual 13MP + 2MP camera set up at the back with a 25MP unit on the front. 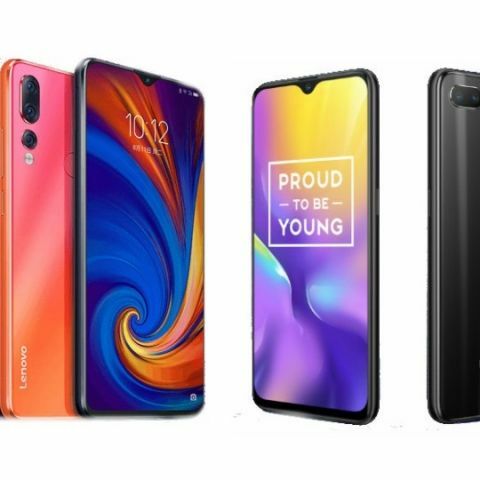 The Lenovo Z5s has been launched in China at CNY 1,398, which roughly translates into Rs 14,000 appx. The company has not given any official confirmation about the device India launch yet. On the other hand, you can get the RealMe U1 in India at a price of Rs 11,999.